Ashe County may be an arm’s length from more celebrated High Country destinations, but the hike up Three Top Mountain is worth the effort. The 4,800-foot summit, named for a trio of rocky outcrops, is the capstone of a 2,300-acre game land initially protected by the Nature Conservancy. From the parking area, the footpath begins beyond an iron gate and follows an old road grade. Despite the absence of a trailhead sign, along the path are intermittent North Carolina Wildlife markers to reassure that you are on route. The trail winds up the mountainside, sometimes through brief steep stretches. At 1.35 miles, arrive at a ridge in a wooded gap layered with fern, and turn right on a single-track trail that climbs up the slender ridgeline. In just over a quarter mile, reach a small clearing. Ahead is a stunning knife-edge ridgeline spotted with rhododendron and other shrubs. 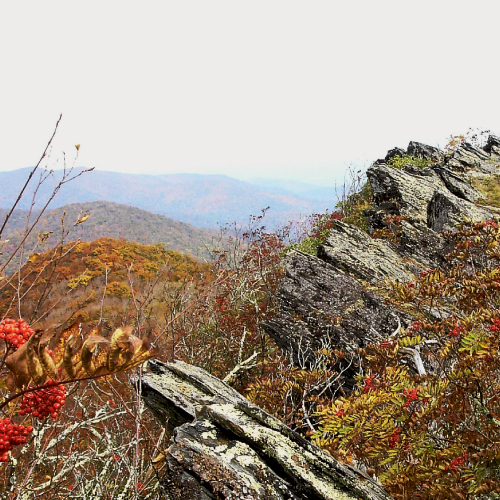 Intrepid hikers can explore a faint path that scrambles over the craggy crest or enjoy the remarkable views of rural Ashe County from the security of the clearing. From the summit backtrack to the parking area. Directions: From Warrensville follow N.C. 88 west for 9.2 miles and turn left on Three Top Road. In a third of a mile, cross a bridge and turn left to stay on Three Top Road. In a half mile, turn left on Eller Road and continue straight onto Hidden Valley Road, which becomes gravel. In 1.9 miles, the road forks; switchback left and in a third of a mile reach the North Carolina Wildlife Game Land-maintained parking area.